Jazz bassist Henry Grimes plucks and strums his instrument with the poise and confidence of a seasoned professional who might well have half a century of experience under his belt. At 75 years old, and having performed in more than 24 countries, that’s a perfectly reasonable assumption. But here’s the truth: for nearly half of his life, beginning shortly after his days as a Juilliard student and continuing until 2002, Grimes was stuck in Los Angeles without a home, without a car, and without a bass. Following 35 down-and-out years, Henry Grimes has started performing again. The Philadelphia-native was born into a musical family, and was inspired to pick up the violin after hearing the orchestra at his older sister’s graduation. His parents, both former musicians, bought him a beat-up violin, and young Henry spent his time jamming with his twin brother, a clarinet and sax player. After years of playing in orchestras, jazz bands, and garage bands, Grimes eventually picked up the bass. His natural skill and love for the instrument would lead him to leave the violin and pursue the bass in college. In 1953, he entered Juilliard to study with New York Philharmonic bassist Fred Zimmermann. “Going to Juilliard was a lifelong dream,” Grimes said in a recent interview with The Journal. However, the absence of a jazz program (it would be years before Juilliard established one) didn’t fly well with him. “I remember playing in operas and choral music … there was no jazz, my native form of music,” he notes. In 1954, with a deep desire to play more jazz, he left Juilliard and began a career that led him to work with some of the great jazz musicians of the time. Over the following few years, he played and toured with such artists as Benny Goodman, Charles Mingus, Sonny Rollins, and McCoy Tyner, to name a few. Then, in 1968, when he was presented with the opportunity to perform in San Francisco with Jon Hendricks and Al Jarreau, Grimes did what many young musicians would have done: strapped his bass to the top of a car and rode across the country. Needless to say, the trip was not a good thing for his bass, and when all of Grimes’s West Coast performances were finished, his instrument was in need of some serious repair work. Unfortunately, the damage was so heavy that he could not afford to fix it. Left with no other choice, he accepted a small sum of money for his bass and let it go, with the intention of eventually buying it back. Over the following 35 years, a heartbroken Grimes lived in a single-room occupancy hotel in Los Angeles. “I felt very alone … I didn’t go to any [jazz shows]. I listened to some Chinese or Mexican mariachi music or Texas-Mexican music like that on the radio,” he recalled. With a Juilliard education but no way to put it to good use, he took whatever work he could get, and held a few jobs as a janitor and a construction worker. The absence of a telephone left him out of contact with the outside world, including with his estranged family. Some music publications falsely speculated about him. One claimed that he had started a cult religion, another that he went to work in an airplane factory, and yet another that he was dead. For a creative outlet that did not necessitate owning an expensive instrument, Grimes took to writing poetry. Citing Ezra Pound and Allen Ginsberg as his greatest inspirations, his career as a poet was on the upswing (several volumes have since been published), when an unexpected gift set his life on a new course. In 2002, a social worker from Georgia named Marshall Marrotte caught wind of Grimes’s history and got in touch. The two formed a friendship, which ultimately led to Marrotte arranging for the jazz bassist William Parker to give Grimes a bass. “It was the height of passion. It was really beautiful,” reflected Grimes. And whereas many might have been intimidated or nervous by the thought of picking up an instrument they hadn’t touched in years, Grimes dashed to the practice room and began endless hours of shedding. For Grimes, playing the bass was like riding a bike, because after 35 years, he says, “It was like nothing had changed.” Just weeks in a practice room brought back his technique and skill. Musicality and artistry, it seemed, had grown with age. That year, he began playing concerts all over Los Angeles, and in May of 2003, he made his way back to New York City. “I’m doing more concert work [now] than I ever did [before] in my life,” Grimes says. Since his triumphant comeback he has played hundreds of concerts around the world, given master classes at various universities, made a dozen recordings, and played with superstars like Cecil Taylor, Rashied Ali, William Parker, and the late Bill Dixon. 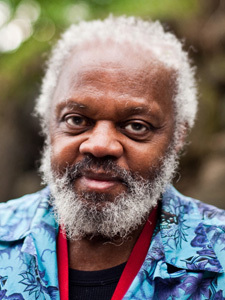 Grimes can be heard on various recording labels such as Atlantic, Blue Note, Columbia, and Prestige, and in 2005, he made his professional debut on the violin. Grimes currently lives in New York City with his wife Margaret and his beloved bass, “Olive Oil.” Although his life hit a bit of a bump—or, perhaps, a mountain—in the road, his unwavering hope and a stroke of luck have brought him back to his life dream.